Here you will find a selection of free lessons for you to download. I'm a very strong believer that learning music and musical content is the best way to make you a better player. That's why nearly all of my lessons are rooted in harmony, reading standard notation (you WILL NOT find any TAB here) and adapting theory to your instrument. Some of these are taken from my eBook courses. If you like what you see and want to learn more plus take your playing to the next level then click HERE to get all of my eBook courses. Here you can download my FREE 21 page eBook course. This is aimed at the bassist that is completely new to reading standard notation. In it I cover: Note names, Note values, Time signatures, Rests, Counting rhythms. Ideally used as a stepping stone to my other, more in depth eBook courses. This FREE eBook is a companion to the 'Scale & Mode Etudes For The Bassist' complete eBook course. The tables and scales in this book are provided as quick references to the etudes and line ideas that I go through in the full book. Here is a lesson/exercise based on major 7th chord tones. This exercise is great because not only does it got you used to hearing the harmony (ear training) but it really starts to open up the fingerboard and makes your THINK about what you're playing. Especially when you play it in all 12 keys and start using altered intervals within the exercise. Here is a short lesson on groove development. In order to groove you need to know what you're playing. This exercise takes a simple chord progression and gives you different theoretical approaches to building a groove. Here is a short exercise using major and minor 10th's. The 10th (3rd up an octave) can be a very musical note when incorporated into your bass lines. This exercise is for you to learn how to incorporate it, Get used to the sound and play it all over the neck. Here is an exercise based around finger independence using scale patterns. This is simply an exercise in technique development. However with all of my exercises there is always musical content that way you're developing your technical ability AND your musicianship in tandem. Here is the chord tone inversion pattern. There are suggestions for altered notes. The exercise uses the harmonised major scale. But once you start to incorporate altered notes the exercises forces you to think in pitches/notes rather than patterns. As with everything, playing it in all 12 keys is strongly advised. Here is an exercise in using chromatic approach notes. Using approach notes are a fantastic way to make your lines more interesting and musical. Plus are essential in understanding walking bass lines. Use this table in conjunction with the chord tone inversion and approach note exercises. Here is a simple scale exercise. This is based on the harmonised major scale ascending in thirds corresponding to the chord. The descending pattern is using four note groupings. This is a great exercise for dexterity, fingerboard knowledge and improving harmony. Play it in all 12 keys. Here is a very useful exercise for fingerboard knowledge using the Lydian Mode. Here the mode is split into two 4 note clusters called 'Tetrachords'. The pattern repeats every Major 3rd interval as you move chromatically up the neck. 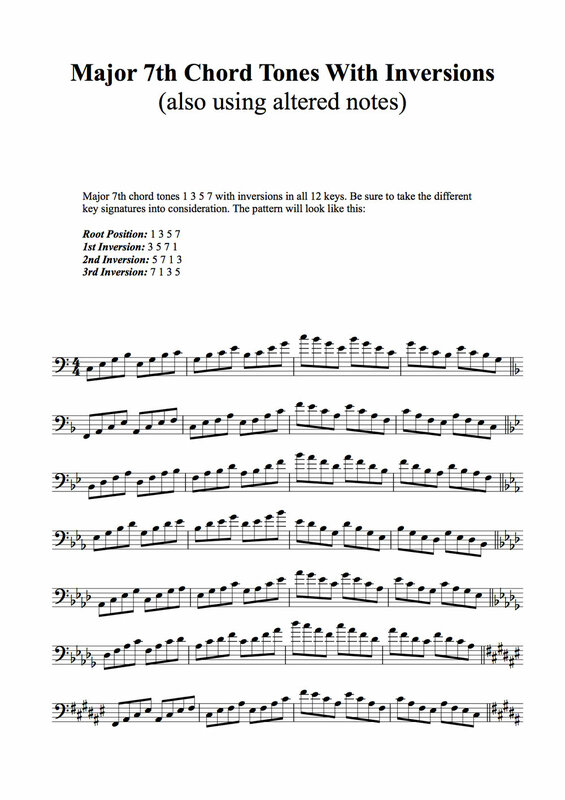 Play this exercise in all keys ascending and descending.